So... today, over a week after Easter, I finally find this cookbook "Pie." I had been looking and looking for it! Today I was not looking for it. Easter being behind me I was doing my other work. But while I was looking for certain documents I saw this big book. Even before I could see what it was, I thought: That is it! After I got through Easter without it! 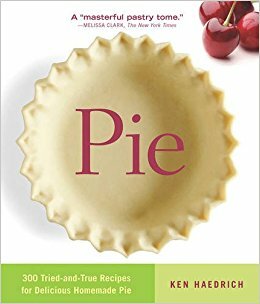 "Pie" is by Ken Haedrich whom I have never heard of although I admire that German name. He has an, ahem, online community called The Pie Academy. It is dedicated to the idea that anyone can make a pie from scratch. As it is, it is just as well that this book stayed lost in my chaotic house until now. Who knows, had I had it, I might not have made Divine Lime Pie. 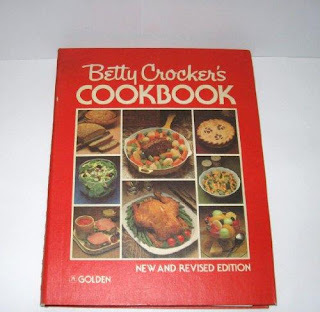 Cookbooks stay lost until you need them! Now, let's see what's in this. I want to make Fresh Plum and Port Pie. And Calvados-Apple Custard Pie. Yikes, Sweet Summer Corn Pie! Could that be in the offing this summer? Golden Delicious Apple Pie with Oatmeal Crumb Topping. Honey Apple Currant Pie in a Whole Wheat Crust. Very Cranberry-Pear Pie. I will have to remember these come fall. Perhaps by then I will be a student of the Pie Academy. Oh, wait! It is free! Where do I sign? I just signed up using that link up above. I am still waiting for my email confirmation. Oh look! It is here! It begins, "Hello, fellow pie lover!" It promises me recipes and insider information regarding the pie community. The crop of bishop's weed is coming in. I think it is going to be a good year! One goal of mine, among many, is to become a good bishop's weed cook. Looking back on my efforts a couple of years ago I am impressed by the idea of red lentil soup with bishop's weed. See, this is why I keep a Web log. Otherwise such details might be forgotten. This evening bishop's weed stands in for spinach in Deborah Madison's mushroom and spinach stew. This is just a simple dish you throw together with a lot of butter, which of course is the secret to its deliciousness. Piously, this being Holy Week, I cut back on the butter somewhat. But it is still yummy. To my shock, the latest issue of Eating Well sings the praises of the bishop's weed. It says to discard stems. When they are this small though it does not seem to matter. The tiny stems add a kind of texture. Harvesting the bishop's weed is very easy otherwise. You just wade into the field and grab huge handfuls! 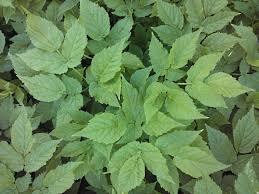 Then next day you have a fresh crop of young tender bishop's weed leaves. And the problem with this is what? I am sort of collecting different names for bishop's weed such as Giersch (the German name), snow on the mountain, ground elder, and goutweed (because it is good for many ailments including gout). Today I found one I do not recall seeing before, Herb Gerard. That is like a name! "Hi, I'm Herb Gerard, and you're sure looking good this evening." Merriam-Webster offers the loveliest explanation. I was married at beautiful St. Gerard's Church. I should start calling this beautiful plant Herb Gerard. 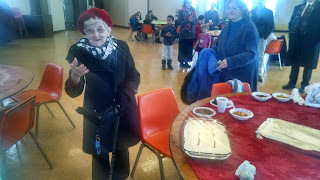 It was Dorothy's birthday recently at St. Anthony's. She is 94. Remember Dorothy? As in Driving Miss Dorothy? I am not driving Miss Dorothy at the moment. My friend Lizzie is driving Miss Dorothy because I am doing the baking for the coffee hour and because Lizzie is just a cool person. As it happened Dorothy had two (2) birthday cakes. One for each of her 47 years which together makes 94. 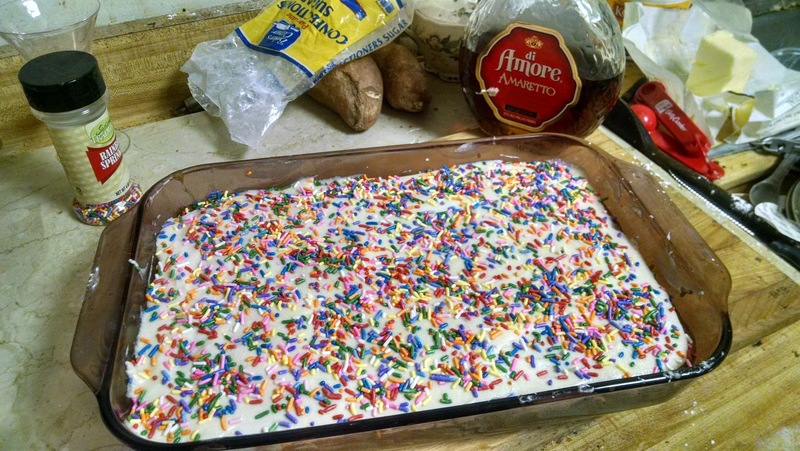 I made one covered in birthday sprinkles. I love making birthday cakes and the icing on the cake is when you get to use those rainbow sprinkles! Remember, I did that last year for Dorothy's birthday. This year Lizzie stepped in and in addition to my cake made something fancier. She made her famous carrot cake! To cakes are better than one! I am not complaining, I will tell you that right now. Dorothy cannot claim, as Leonard Pennario could, to have been baptized at St. Anthony's. She is an immigrant! She remembers being a tiny girl and seeing the Statue of Liberty. That was literally 90 years ago. 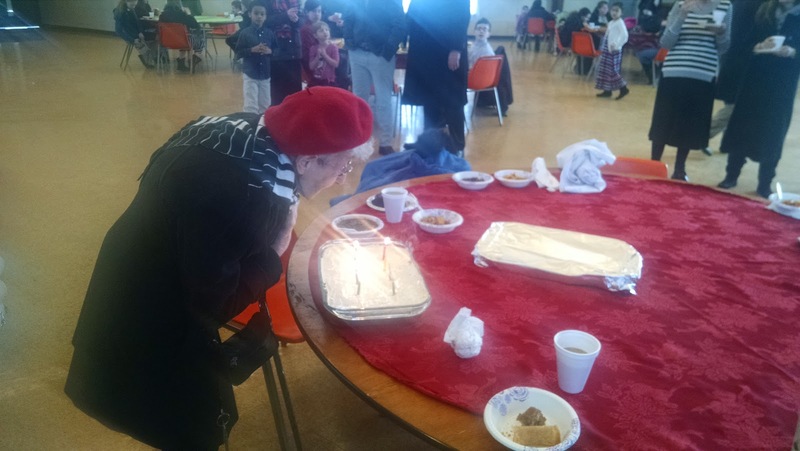 Dorothy blew out the candles which means she will get her wish. I know that her wish must be wonderful. I am getting back on my feet after not keeping up with this Web log so I will be sharing some memories going forward. Recent memories, not distant ones. A closeup of my cake. Hey, with candles it looked really cool! 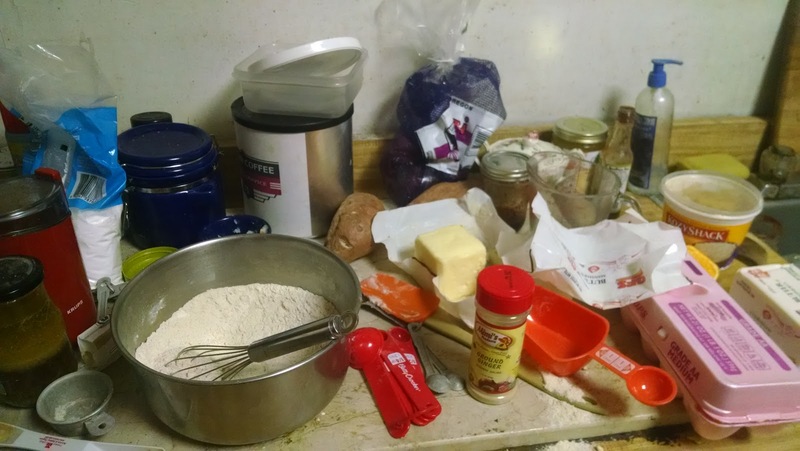 What fun it is, baking a cake, you know? Whose birthday is it next?